This card is beautiful Paula and so peaceful. Wish I was in NZ to attend one of your brayer/sponging classes. Have a lovely and safe trip. Oh my goodness - you're amazing! This scene looks like a photo. I'm seriously in love with this card. Wow, amazing card, love the colours and effect. Beautiful!! WOW - you NEVER cease to amaze me at what you can create. This is a masterpiece. Enjoy your road trip. Paula, absolutely stunning artwork...who doesn't lurve trees!! Very beautiful piece of artwork. I think I would frame this. It's hard to imagine the amount of time and effort you put into just one card. What a beautiful card. I have not done that technique yet but now may have to it is so amazing. Absolutely stunning! I too am in love with this card! I have this stamp set! Could you do a video/tutorial on this card? I would love to see how you did this! Thanks for sharing your beautiful creation with us! What a gorgeous card. I love the colors. Could you tell us how you did that? Wow!!!!! I too, would LOVE to see a tutorial on this one! I am in awe of it's beauty...love the water reflection. 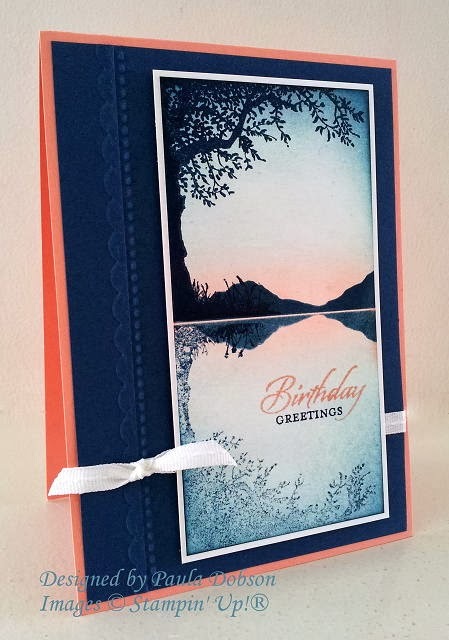 Beautiful card... have a lovely trip and I look forward to seeing how you made it! Paula you have outdone yourself on this one! Simply breathtaking …. if I hadn't known better I would swear it was a photo. Fabulous, fabulous …. add me to the list of who would like to see a video tutorial ..